Many thanks for all the birthday wishes this past Sunday! In all honesty, I couldn't have asked for a better day -- went wine tasting out in Sonoma with the man friend (where we were greeted with plenty of sunshine) followed by a delicious dinner at The Girl and the Fig (also in Sonoma). When it really boils down to it, just give me some good wine, cheese and a California sunset and I'm a happy girl. How was your weekend? Any adventures you'd like to share? Gorgeous! Such a stunning silhouette. Happy Birthday lady! I always love the how flowy dresses and leather looks together! love those pleats. Your style is always so inspiring! I really love your style! Amazing outfit! Always love a leather jacket with a pretty dress - this looks gorgeous on you! Gorgeous dress and very nice background on your photos! Dress is amazing! I love the contrast between its delicate material and the jacket! Your dress is beautiful. Love the combo. Gorgeous!!! Gorgeous! I would love to be in Sonoma! Wow how beautiful is over there! Love the clutch and mint nails were a perfect touch! So, I heard of this great sale that JCPenny is having - I went there yesterday, I bought a beautiful dress for only $15 - and guess who the dress reminded me of? YOU!!! I fell in love with it. the funny thing is that it looks very similar to this...but not exactly. Anyway, I just love your pics. have a great day. I really want to go to that place, heard great things about it. Next visit. Pretty dress. seriously obsessed with that dress! gorgeous setting, too! Adore the dress, would be perfect for an upcoming wedding I'm a guest at. You had a great Bday!! I went to Madrid with two friends, we spent the weekend doing what girls love the most: Shopping!! 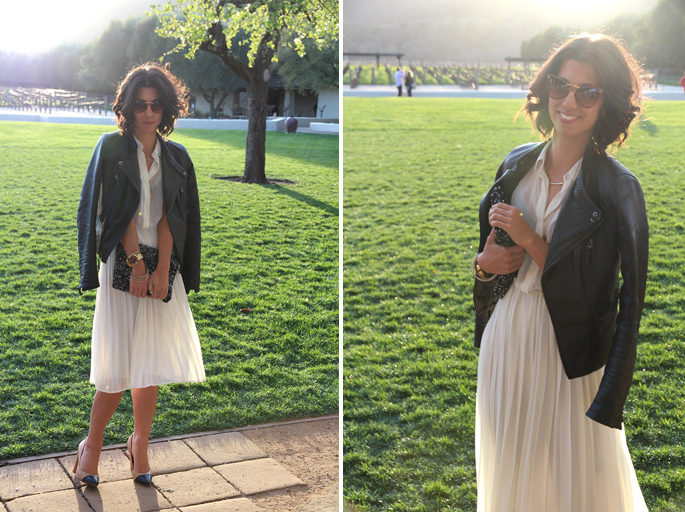 I'm really loving the flowy chiffon look paired with a leather jacket. It's the perfect mix of chic and rock to balance out the outfit. So beautiful! I love this outfit... It's perfection! That Dress! I want it so bad. What a beautful place to take pictures! I love the leather with the sheer dress. Great combo! I love this whole outfit! I like pairing feminine pieces with edgy things like a leather jacket! And I really wish I got that sequin Zara clutch while I had the chance, now I can't find it anywhere!! i really love this outfit, this dress is so beautiful. Gosh I miss wine country, that is a fantastic idea for a birthday get away! I love me some wine and cheese. My boy and I stayed in this past weekend and had a "why go out for a burger when you could have steak at home" nights. Basically these evenings consist of me making filet mignon at home. i love the softness of your dress with the edginess of the jacket. I looove this look.... girly and sweet mixed with an edgy/tough leather jacket. One of my faves! Absolutely love your blog! and that outfit is PERFECT. I too went away for the weekend with my "man friend" :) We went to La Jolla it was so lovely. Happy Belated Birthday! I love this outfit it's so so pretty! Loving the Kors watch, they're such a sought after accessory at the moment, I am currently coveting one! You look gorgeous! Sonoma is indeed an amazing place. I am in need of a trip there soon. I know you had an amazing time. This is my first time commenting - I had to because I love what you are wearing today! Beautiful! I love the look of feminine dress meets masculine jacket. Happy belated! What beautiful photos!! It sounds like an idyllic weekend. Happy Birthday! And I'd love to know what nail polish you've been wearing in your past few posts (the mint green)-- I love it!! beautiful dress! love these photos, beauty!